Fischer officials at the media event. 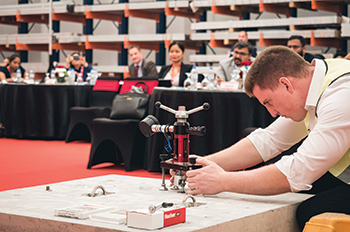 Among such plans for the region, the German group’s regional subsidiary fischer Middle East intends to open an “experience” centre in Abu Dhabi this year which will display and provide hands-on experience in using fischer products. These plans were announced at its annual media meet attended by Gulf Construction last month in Dubai, UAE. 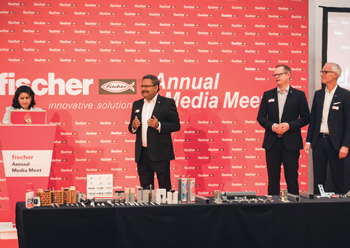 Sven Haag, managing director of Asia, Middle East and Africa, provided an overview of the fischer group of companies of which fischer fixings systems is the largest division, accounting for 75 per cent of the group sales of $864 million. At the meeting, Haag also indicated that fischer has ambitious plans for the future including setting up of a production facility in the region. Testing chemical anchors ... at the event. Fischer, a specialist for safe and economical fixing and connecting elements for the construction industry, has become the market leader over the last seven decades. Its extensive product portfolio caters to the whole spectrum of fixing requirements in a building project and ranges from chemical systems across steel anchors right through to plastic plugs. Covering more than 15,000 articles, its product line includes dynamic anchors for earthquake zones or for severely stressed buildings, fire protection fixings, innovative facade systems, a wide range of screws, special products for composite thermal insulation systems, heating, ventilation and air-conditioning (HVAC) installations, adhesives, sealants, foams and drill bits. Haag also indicated that the family-owned enterprise – which operates 47 of its companies in 35 countries and exports to more than 100 countries – has recently expanded its portfolio with the acquisition of Germany-based BWM Fassadensysteme that offers energy-efficient, safe and lasting façade construction systems. It has also taken a share in 3D printing start-up Xioneer Systems, intensifying its activities in the field of additive manufacturing. Jayanta Mukherjee, managing director of Middle East and Africa, who set up the Dubai office way back in 2006 with a staff of two, traced the company’s growth from “Sand to Glory” in tandem with the emirate’s astounding development. He highlighted how the company secured high-specification projects such as those that had required fixings for installation in eco-sensitive coral environments and the immense load-bearing capacity of its chemical anchors. A highlight of the event was the live video streaming that took media delegates to two key projects where fischer fixings were being installed: a Dubai Expo 2020 site and the extension of the Grand Mosque in Makkah. Mukherjee indicated the regional office’s success has been such that it is now responsible for fischer’s activities in 10 countries, with the East African market having been assigned to fischer Middle East last year. Among other plans for the region, he stated that the Klaus Fischer Award for Best Engineering and Management, which has been hitherto conferred in Europe and China, will soon be extended to the Middle East, and fischer Middle East is currently tying up with engineering schools and management colleges to initiate this award for the best students. Another award has been earmarked for contractors to recognise engineering excellence through the Best Engineering Project Award. Also, an engineering support vehicle will be introduced by the company to visit jobsites. Fischer also intends to expand its offerings to the mechanical, electrical and plumbing (MEP) sector during this year, which is a key segment for the company. At the event, Mostafa Elhosseiny, head of technical services for Middle East and Africa, emphasised that fischer fixing systems are future-ready as the group has invested in building information modelling (BIM) software to support engineers. The annual media meet was held at fischer Middle East’s office and warehouse in Jebel Ali, where top priority is accorded to human resources to ensure the well-being of its staff. The facility includes a training centre.